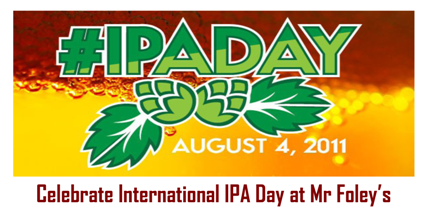 For the benefit of those who don’t follow me, or pretty much any other beer blogger, on Twitter; I’ll start off by letting you know that there’s a genuinely exciting beery event happening next week called International IPA Day. Thursday the 4th August is set to be a celebration of the much loved beer style India Pale Ale and its importance in the "Craft Beer Revolution". Started by a handful of bloggers in America it has quickly spread across the beer drinking World, predominantly via the power of social media and without the involvement of the traditional press or any corporate sponsors. Anyone can get involved, and everyone’s invited - A truly grassroots movement. One of Leeds best pubs, Mr Foley’s on The Headrow, is getting involved and serving a huge range of IPA’s from keg, cask and bottle to delight the taste buds of Leeds drinkers, as well as some talks from a number of brewers serving beer at the event and two of Leeds finest Beer Bloggers – Zak Avery and Mark Fletcher. There’s even talk of some curry to go with this historically Anglo-Indian beer-style, which is quite frankly a happy bonus! 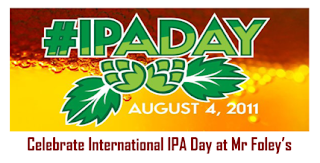 If you want to read more about IPA Day then visit the event page, or search the hash tag #IPADay on Twitter. I’ll be there on the day and Tweeting throughout, so follow me at @EisntCNeil for a live rundown of what’s tasting good. As you can see from the list below Mr Foley’s have secured some really special beers for the event, lots of exciting new brews such as Summer Wine Brewery '7C's of Rye', Magic Rock Brewery 'Human Cannonball', and Thornbridge Brewery 'RyePA'. A few exclusive beers you won’t find anywhere else such as Brewdog’s 'Hello, My Name Is Ingrid', which was brewed solely for the Swedish Market and Roosters Brewery 'Underdog IPA' which was produced especially for #IPADay at Mr Foley’s. Add to that a dedicated fridge containing 13 different bottled and canned IPA’s from the UK and USA and you’ve got an event with more hops than a bag of bunnies. Nice! There's some really good beers there and I now have a massive thirst for a big IPA! Yeh Dean has really pulled a blinder with sourcing these beers. Especially the Craft keg lines. Can't wait to give Ingrid a go!